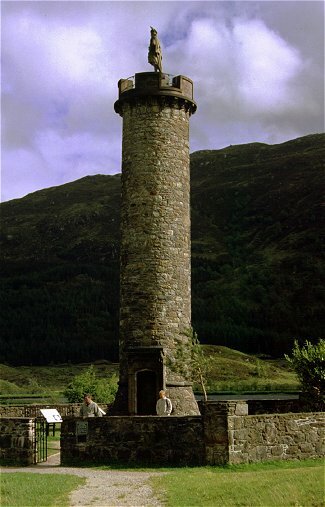 Glenfinnan is a popular place and firmly established on the tourist map. Sited on both the road and the famous railway line between Fort William and Mallaig the village makes an obvious stopping off point. With an unrivalled view down the long Loch Shiel, the '45 monument sited right at the head of the loch, and the always impressive Glenfinnan Railway viaduct behind this is one of the classic calendar shots of the Western Coastline. Yes, this view, along with that of Eilean Donnan further north in Kintail, is one of those that virtually any coach tourist can say 'been there, done that'. This area played a major role in the life of Prince Charles Edward and much of the initial support given to him came from this area. The monument is a tribute the men and times of 1745 and the statute that adorns the top is of one of Prince Charles' clansmen. The National Trust Centre provides parking and a cafe for visitors, as well as an information centre outlining the history behind the man and of the region. Across the loch is the large Glenfinnan Hotel, a building very much in the Victorian style with huge rooms, stair cases and reception halls. The main bar looks out over the head of Loch Shiel, through the valley to the east and down the length of Loch Eil. The unmistakeable profile of Ben Nevis and the Aonachs are framed behind the large sash windows. Beyond the hotel is a jetty from where cruises and trips on the loch are run through the summer months. It had been a wet morning but as often happens the weather cleared around lunch time and promised a brighter afternoon - even if there was little chance of the main tops clearing. We were based at Corpach, west for Fort William, and we thought that we might explore the Loch Shiel area. 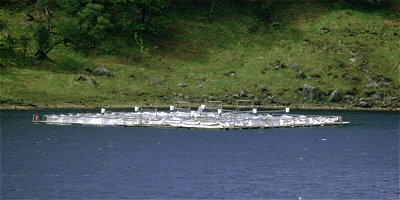 The southern end of the loch is forested and an access track runs from the north along the southern shore as far as Polloch, which is the road end for a very minor road from Strontian on Loch Sunart. This is obviously ideal biking territory and we were passed by one group on our walk. Loch Shiel is a fraction above sea level and hence is not tidal. It is however extremely deep, over 120m as indicated on the maps, and at its narrowest point only 600m wide - a classic case of glacial erosion. The loch is therefore much deeper than the ocean floor as far west as the continental shelf to the western seaboard. The Glenfinnan end of the loch is dominated on the north side by the long craggy ridge under Beinn Odhar Mhor, and on the southern side by the equally rough looking mountain sides of Meall a' Choire Chruinn. The northern ridge of this mountain top drops right down to the loch side - making a focal point in the famous view along the loch. The Callop River drains the corries behind these ridges and, somewhat surprisingly, drains west into Loch Shiel rather than join the Dubh Lighe that enters Loch Eil - they are less than 1km apart at one point. The Callop cannot be crossed where it enters Loch Shiel and the walk starts from the bridge 2 km east along the main road. A path goes up this glen and over the head into Cona Glen which can be followed east to the shore of Loch Linnhe. A branch is shown as turning west and whilst not connecting with Loch Shiel, a route could be possible over the valley head and down to Scamodale on the lochside - the trees could be a bit troublesome. Not wanting too much effort in the half day left we followed the track through the forest to the loch side opposite Glenfinnan village. This gives an unusual view over an island to the village, the large hotel on the far shore, the church set back amongst the trees, and of course the monument and the long viaduct crossing the mouth of Glen Finnan. You can see the white reflective metal of the cars and touring vans in the visitor centre car park, the huddle of viewers on the knoll above looking over the viaduct, and even the red jackets of the tourists who have climbed the monument itself. This side of the loch is much, much quieter. After playing with the camera and long lenses we set off down the lochside. The surrounding mountainsides looked decidedly rough and any traverse of the long ridges on either side would undoubtedly be hard going. We passed the small cottage of Guesachan at the foot of the ridge to the two tops of Meall a' Choire Chruinn and the higher Sgurr Ghiubhaschain. Ascents of these from this point are possible. Beyond the track rises and falls slightly, giving opportunities of slightly elevated views along the loch. Across the way some fish farm nets were moored. We were approaching the start of the wooded shoreline some 3km short of Scamodale. Deciding that there was little point walking into the trees we turned around and walked back along the track. The sun brightened for a bitgiving us the chance to try a few more photos across the Glenfinnan. 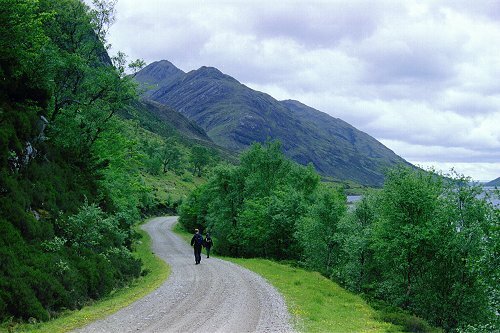 We have been up Glen Finnan a couple of times - it makes a very easy walk into the heart of the mountains. It is also a well known access route to the north passing over the head of the valley between Sgurr Thuilm and Streap and on to Strathan at the head of Loch Arkaig. We have walked this route (in reverse) on a four day trek from Inverie on the northern shore of Loch Nevis. This is also the access to the Glenfinnan Horseshoe - reputedly a magnificent round of Sgurr nan Coireachean and Sgurr Thuilm. The track passes some estate cottages just before it goes through one of the enormous arches of the railway viaduct. This structure is made of concrete - one of the earsliest applications of mass concrete in a large structure - a material that does not look at its best when viewed at a short distance. However, by clambouring up the hillside to the level of the track an excellant vantage point can be gained looking around the curve of the structure. 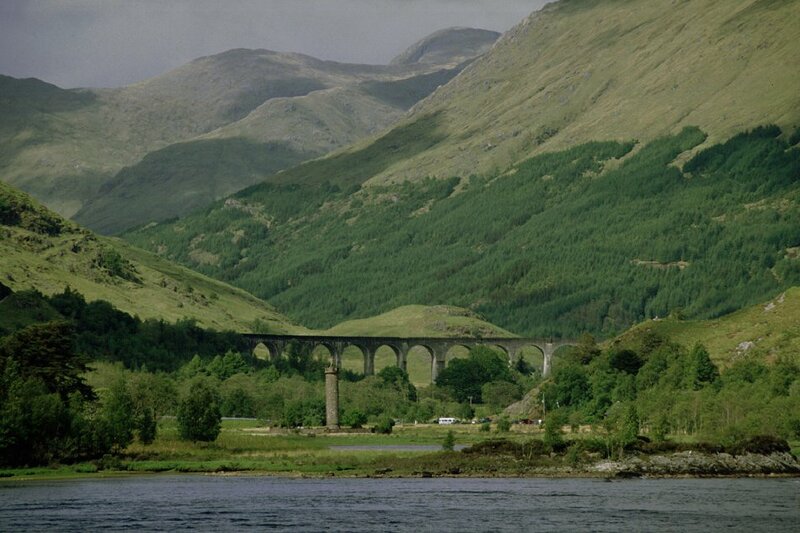 Time this with the arrival of the daily summer steam special from Fort William to get the best from the view. Don't be fooled by the rough surface to the track that starts up the glen from the roadside, after a few metres it resorts to a smooth tarmacadam surface that runs all the way up to the 'Lodge' on the hillside above Corryhully. The 'Lodge' is a real - er - contrast - entirely in the style of a brick built house so common in the modern housing estates of southern England. At least the ivy growing up the sides has started to disguise the harsh outline of this dwelling. 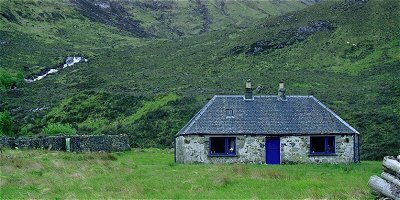 Below the house is an estate run bothy - one that includes electricity - that makes a convenient starting point for the round. Cars are not allowed up the glen, however there is no objection to cycling the first 4km or more. A good track continues for 1.5km to a substantial bridge that crosses the river draing Coire Thollaidh. Beyond a rough track, with river fords lined with concrete railway sleepers continues well up the main valley to the col marked as a 471 m spot height on the map. The upper areas of the valley have been afforested relatively recently - a fact that is only revealed on comparatively recent maps of the area. Knoydart and Morven, The Scottish Glens Book 8 includes sketches of this walk and associated notes. However as explained above this is not much use in detailed navigation. W H Murray's Companion Guide to the West Highlands of Scotland details the role this corner of the coast played in Prince Charles Edward's life in 1745.